Oh chocolate chip cookies. 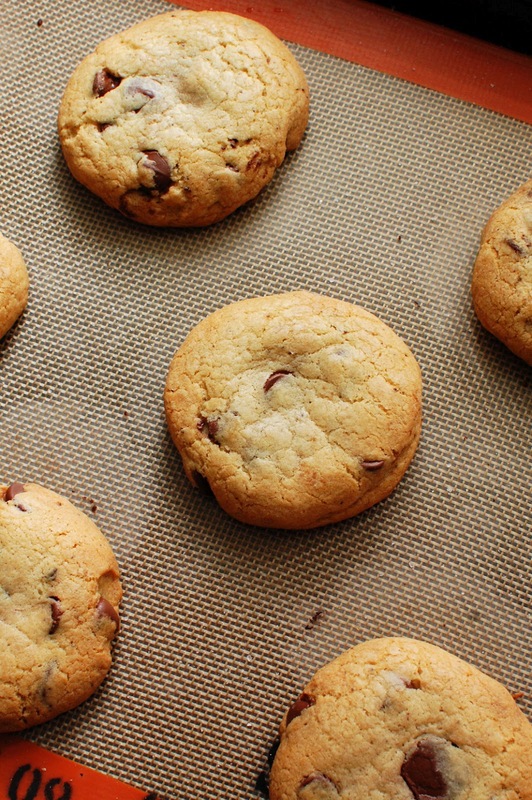 There are SO MANY recipes out there for chocolate chip cookies. After growing up eating the Nestle Tollhouse recipe with only have the chips (my dad made us make them with half the chips – seriously! ), I thought I had found the one with Alton Brown’s The Chewy. 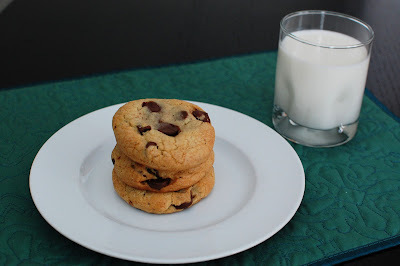 But since finding that recipe, I’ve tried quite a few other chocolate chip cookie recipes (even some with bacon, molasses, and pretzels baked into them!). And there are still tons out there to try. 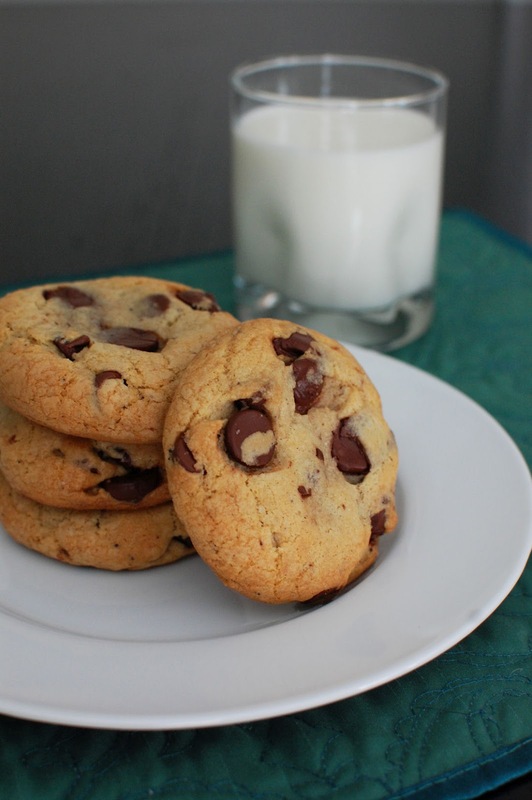 Instead of settling for just one go-to recipe, I’ve opened my mind to trying as many as I feel intrigued by… I figure some day I’ll whip something up that takes my favorite aspects of a few different recipes to come up with an ultimate chocolate chip cookie recipe. But until that day, I’ll keep trying new ones, and remaking old ones. 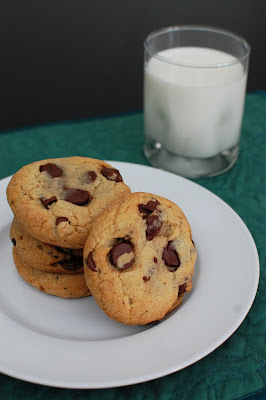 Every chocolate chip cookie recipe I’ve tried has had something to love. This recipe is no exception. It’s similar to other recipes that I’ve made, since it uses melted butter. Instead of just melting the butter, you take the butter to it’s delicious nutty browned butter state. Browned butter will definitely be in my ultimate chocolate chip cookie recipe. The dough also rests in the fridge overnight. I love doing this with cookie dough for two reasons. One, it gives me a chance to whip up the batter one night and just cook the cookies the next day. Two, chilled cookie dough holds it’s shape better. So when you use a scoop you get nice round cookies, which I love. These are BIG cookies. I used the ice cream scooper that I use to portion cupcakes. I’ve decided that I’m using that scooper for all cookies from now on. I decided to add a sprinkling of sea salt just before baking them. I’m a firm believer the salt should be used to enhance flavors. Desserts are no exception to that rule. I actually forgot to sprinkle sea salt on the first tray, even though it was sitting on the counter. Hubby and I agreed the ones with sea salt were much much better. Even if you don’t try this recipe, I suggest trying a sprinkle of sea salt on your next batch of cookies. I took these cookies to a party and they were a huge hit. This was no surprise. Hubby has always claimed that he’d rather eat cookie dough instead of a baked cookie. Not these puppies. He couldn’t keep his hands off of them. Browned butter, cream cheese, and a sprinkling of sea salt take these chocolate chip cookies to the next level! Melt the butter in a saucepan until brown and set it aside to cool. Cream the butter, cream cheese and both sugars together with an electric mixer until smooth. Turn the mixer on low and mix in the flour, salt and baking soda until just combined. Cover the dough and refrigerate until chilled, several hours or overnight. When ready to bake, preheat the oven to 375 degrees and line a few trays with baking paper. Roll 1/4 cup size balls of dough and place them on the trays. Flatten slightly. Sprinkle with sea salt.